BinaryOptionsNow – Renowned online trading software provider and developer SpotOption has announced that it will offer pair options trading on its binary options platforms. The initial websites that use SpotOption software and thus offer the new pair option trading are TradeRush and Banc de Binary. SpotOption is one of the biggest online trading software providers and pair options trading is a new trend that is slowly being adopted by more and more binary options brokers. Check below to find out more about the concept of pair binary options and learn about the brokers that already offer this service. What are Pair Binary Options? Pair options are the newest trend in the binary options business. They differ from regular options in the sense that they are tied to two distinct assets instead of just one. The two assets making up the binary option trade are usually of the same type, such as Microsoft vs. Apple, British Telecom vs. Vodafone and similar. The concept of these options is very simple to learn and understand and is very entertaining and exciting as well. Traders will be presented with a binary options trade that will involve two distinct assets of the same category. Traders’ task will be to select the asset that is expected to perform better. As an example, just imagine the following: A trader is presented with a trade for the pair Microsoft vs. Apple. The promised payout is 80% and the trader bets $100. The trade proposes that at the end of a certain period of time Apple will perform better than Microsoft. If the above proposition is true and Apple indeed performs better than Microsoft, then the trader will be paid out $180. In case Microsoft performs better, then the trader will lose his or her bet. This is essentially a standard binary options trade but with an exciting twist. The first website to offer these types of pair options was StockPair, which was launched in 2010. At StockPair, traders have a choice of various index and stock pairs to trade depending on which markets are open when one Below you can see what the trading interface looks like for a Microsoft/Apple pair option that expires at the end of the trading day. If Microsoft performs better than Apple, the option pays out 101% of the investment amount. 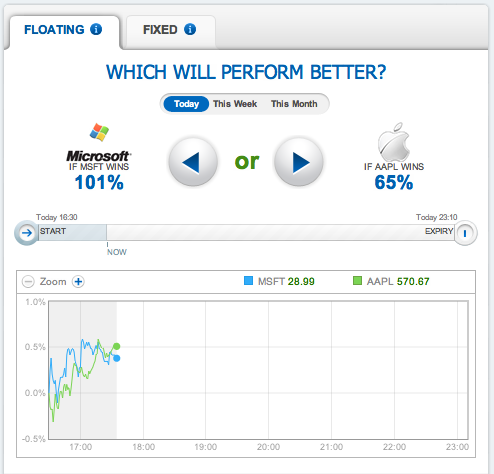 Hoever, if Apple performs better than Microsoft, the options pays out 65%. The biggest advantage of pair binary options is the fact that they are neutral in the sense that it’s not relevant if the market moves up or down. The only thing that matters is that the selected asset performs better over a period time than the second asset. Both assets may fall, but the trader still wins if the chosen asset performs better than the other. Also, only three parameters need to be considered in pair binary options trading. These are position, duration of the option and the invested amount. Pair options can also offer relatively large payout rates which are not available in most conventional binary options types. Premier online trading software company SpotOption has announced the launch of a new pair options service. This will complement the venture’s vast portfolio with the new and exciting binary options type of pair options. SpotOption was established in 2008 and since then it managed to become one of the most successful binary options trading platform and software providers. The venture offers various software solutions to a multitude of online traders. The venture offers its software solutions for multiple platforms such as web browsers and smart phones. This will enable traders to access their binary options platforms anywhere on the planet where an internet connection is available. SpotOption’s two leading binary options brokers TradeRush and Banc de Binary will be the first ones to offer the new pair options trading service developed by SpotOption. At this moment there are only a limited number of pair options brokers available on the web, therefore these two ventures are expected to receive a lot of attention now that they offer this service. Both ventures are big names in the business. TradeRush is one of the biggest binary options brokers on the market. The company offers trading possibilities on more than 85 assets which constitutes one of the biggest trading selections in the binary options industry. Banc de Binary is a binary options broker that constantly strives to introduce new features and developments that aid traders in maximizing their profits and enjoying a unique online trading experience. The introduction of pair options considerably improves the service offering of these two companies.